Ch. Lakeside's Night and Day, "Cole", is a multi-champion. 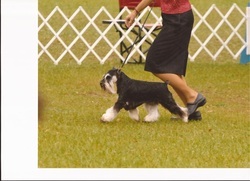 He competed at the 2007 World Dog Show and won the breed from the classes over 80 black and silver males and females. He is a striking black and silver with extraordinary movement, structure and a gorgeous head. He was also finished out of the Bred-by class. He is Rooster's fourth champion.